Chamilia Heart Snap Bangle Large 8.2" is rated 4.8 out of 5 by 6. Rated 5 out of 5 by Anonymous from Lovely Bangle Lovely bangle at a great price, bought as a gift for my best friend who loves it. I found this website easy to use and delivery was quick and easy also. Would recommend the bangle and this company. Rated 5 out of 5 by Anonymous from Fantastic alternative to pandora If you're looking for a bangle than this plan silver bangle is hard to beat on quality. I would suggest that it's as good if not better than the premium brand. 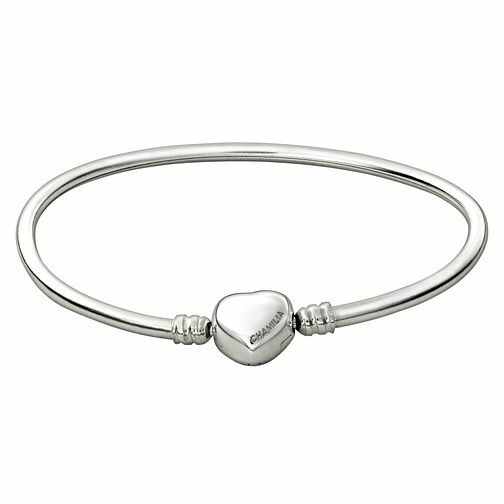 Gave this bangle and a couple of charms to my girlfriend for Christmas as she already has a pandora bracelet and didn't want to add to that.